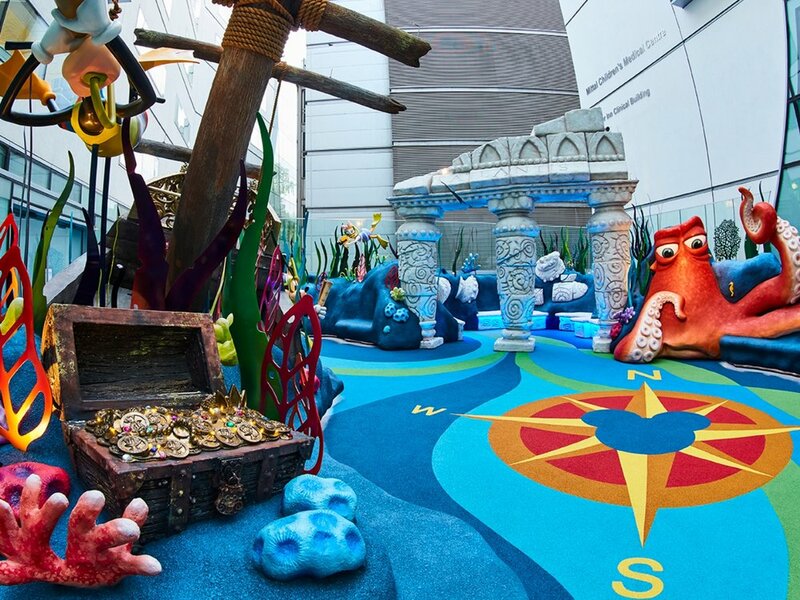 The Disney Reef, a colourful, underwater-themed space of approximately 3,000 square feet positioned at the heart of London’s Great Ormond Street hospital was designed and developed by a creative, cross functional project team at the Walt Disney Company supported by a small group of external designers in collaboration with the charity and hospital’s staff and patients. In addition to being one of the prime design collaborators Propability were also engaged to construct and install the immersive Disney environment. Propability were integral for over 2.5 years to the whole journey, from creative concepts to opening launch. The Reef is an underwater landscape featuring numerous coves, reefs and even an underwater cave. A magnificently detailed, sunken galleon takes central stage and sits opposite the remnants of the lost city of Atlantis (inspired by Disney’s Atlantis: The Lost Empire). A giant clam sits with its outer shell to the rest of The Reef, the concave cocooning of the inside of the shell providing a haven of tranquillity for those needing a quiet moment, the outer shell encases softly, twinkling fibre optic lights. Lighting is a very important aspect of The Reef, as are tactile and sensory elements, including low tech treasure trail puzzles and high tech Disney video games found on the three touch screen monitors imbedded into the cave walls. Throughout the Disney Reef the coves, bays and landmarks are populated with sculptures of many familiar Disney characters. There is Mickey Mouse and Minnie Mouse, Goofy, Ariel from The Little Mermaid as well as Nemo and Dory with a 2.4 metre tall Hank, the lovable septapus from DisneylPixar’s Finding Nemo. All characters were brought to life by Propability, many sculpted traditionally by hand and others created using Propability’s 6 Axis milling robot. The site installation commenced in early April 2018 and lasted for nine weeks. Due to the sheer size all elements of The Disney Reef were craned onto the site. Once in position the scenery was pieced together like a giant three dimensional jigsaw and the joins expertly treated for a seamless finish. Propability ensured that all aspects of The Reef are durable, safe and sustainable with structural steels inside the masts and the Atlantis arches to ensure the environment stands up in all weathers.